Sebastian Echeverria was taking out trash when his roommate brought to his attention that there was something strange with his car. In the early morning of March 26, Sebastian Echeverria was taking out his trash when his roommate brought to his attention that there was something strange about his car. Echeverria realized he had become one of several victims of recent tire thefts at Tivoli Apartments. 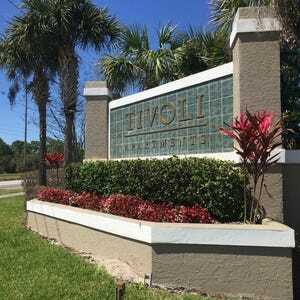 On April 7 at 6 p.m., Tivoli administration invited residents to speak with Seminole County officers and a UCF safety representative during a meeting addressing the safety concerns about the tire thefts. Three cars, a Nissan Altima, Nissan Xterra and Toyota Corolla, had all four tires and rims stolen on different nights. Echeverria, a sophomore at Seminole State College, recalls the moment he discovered his car was missing its tires. “My roommate, he was looking at my car, and he thought I crashed it," he said. "He was like, 'dude your car looks weird' so he went up close and was like 'dude your car has its tires missing.'" Echeverria said he waited by his 2015 Nissan Altima for a Seminole County officer to arrive. The officer observed the car and dusted for possible finger prints. A finger print was found on the bottom left side of the car near one of the stolen tires, but Echeverria was told that it will take a month to see if anything turns up from the finger print or any evidence. Meanwhile, he said he spent approximately $3,500 on a rental car and new rims and tires. Throughout the meeting, which was attended by eight residents, students asked about what could be done to prevent this. The three Seminole County officers at the meeting said that residents should park where it is lit, lock all vehicles and always be aware of surroundings. However, Echeverria said he did park in a lit area, but it was not lit by Tivoli. It was lit from a building with flashing lights across the parking lot. He said his car even had Nissan manufactured locks on it. Tivoli has Seminole County officers patrolling the area during different times. Deputy Mike Stapp, who attended the meeting, said he was working on March 26 and left at 3:58 a.m. that Saturday morning. At 5 a.m., the next area control officer arrived at Tivoli. The officers said during that one hour gap is when the crime likely occurred. Echeverria spoke up about what he thought needed to be addressed as far as Tivoli’s safety issues. “The cameras are the number one thing and of course better lighting in all these areas,” he said. Although the meeting focused on the recent criminal activity in Tivoli, A.J. Range, assistant vice president of UCF's Neighborhood Relations and Safety Education, gave some insight and tips to students regarding safety in general. “As college students I need to let you know that there are folks outside of the community, outside of the university that look at you as ideal victims,” Range said. He stated that students need to be aware of their surroundings and the potential threat around them. “You’re a sitting duck. You have a target on your back and you don’t even know it because you’re not aware of your surroundings,” Range said. Seminole County also commented to never be out at night alone, to always lock your doors and windows and if you see something suspicious, report it.